Two of my favorite modes theses days is JT65 and JT9. MacLoggerDX, WSJT-X and JT-Bridge make a powerful and fun combination. I have grown to enjoy the weak signal modes even with bad propagation. I can always make contacts on 20 Meters during the day with 5 or 10 watts. It’s not unusual to make contacts on 15 Meters into South America too. This is for a Mac OS. Like I’ve said before, even if you are on a PC, this is something to look at and consider. Getting MacLoggerDX (MLDX) installed is a breeze. I made a clip on it and WSJT-X which you can see here: Icom 7300 MacLoggerDX Setup. Everything on this page is using just the one USB cable. In WSJT-X I am using the Icom 7300 for the rig and disabling the rig control in MacLoggerDX (See the video below). JT-Bridge is very easy to install as you’ll see in the video below. Just download JT-Bridge and drag it to the Applications folder. For JT-Bridge to log your QSO’s into MacLoggerDX, in JT-Bridge you’ll need to click on File and then Open. Navigate to your MLDX log and select it. You’ll only have to do this once. The next thing is getting WSJT-X and JT-Bridge connected and working together. There are snapshots on the next page. Click on the snapshot to see the full image. Holy smokes! This was fantastic. I poured over the documentation for all three programs for hours, jt-bridge suggested a different setup (controlling the rig from MacLoggerDX), which didn’t make sense, but I thought if thats what the documentation says it must be the right way to go. But that just confused me. Really liked your screen layout for all three as well, and I copied that too. After watching this I’ve logged 30 states and eight countries! In which app do I File->Open->logfile? If it is MLDX, there is a whole directory for logs, any file in particular? Thank you for commenting and visiting my website. The location of the log file can be different on each Mac. It depends on where you stored your MLDX log file. When you created a log in MLDX, where did you store it? That would be the log file you use. Yup. Figured it out shortly after asking of course. Was just one too many improper pronouns that could have pointed at JTBridge or MLDX, and I’m always a bit squeamish about pointing things at sql files. Darn English language. I know just what you mean. It took me a while to get used to the iMac and file handling. Rich, Good luck. I am getting close. Once I ahve everything all set up properly, I will let you know. I finally resolved my issues after several phone calls to support at both Apple and Silicon Labs. It turns out I had an issue with the Fusion Drive on my Mac Mini, that prevented the Silicon Labs drivers from properly loading and then being recognized by my IC-7610. I had to disable the Fusion Drive Function, and in the process discovered that the hard drive portion of the Fusion Drive had numerous sector errors. Only real solution was to get a new drive and then do a clean install of MacOS High Sierra, as well as all my Mac application software. I probably could have done a restore from my Time Machine backup, but didn’t want to also restore any issue that I had. I installed WSJT-X 1.80, JT-Bridge 2.3.0, and MLDX 6.16, as well as the Silicon Labs drivers. I was able to easily interface WSJT-X CAT control for the IC-7810 with no apparent issues. All CQs from WSJT-X properly appear on the JT-Bridge log screen. Also, I was able to set up JT-Bridge to properly interface with MLDX to verify stations that I had previously worked as well as confirmed (color coding). Clicking a CQ on the JT-Bridge log screen also opens the contact in MLDX, so that interface seems to be working ok.
One issue remaining is that when I complete a QSO in WSJT-X (Sending a 73), the QSO is not automatically logged to MLDX via JT-Bridge, like it did in my previous setup with my old Elecraft K3. I have sent a note to Anders Östlund, the author of Jt-Bridge, but have not heard back from him yet. I am sure I have some setting that is not quite right in either WSJT-X or JT-Bridge, so will keep playing with. Just wondering, if you might have seen a similar issue? Thank you so much for commenting and I am afraid that it will be something like that for me. I will have to re-install everything and try it again. Thank you, thank you, at least I know I’m heading in the right direction. I can’t do it right now, but I’ll try to resolve it later. When I had my Elecraft K3, I used MLDX for logging as well as JT-Bridge. The combination with WSJT-X worked well with no hiccups. I am trying to duplicate that software setup for my IC-7610. I tried it and I see what you mean. It is not working for me either. As you said, it will work in MLDX. Thank you for getting back to me. Yes, I have tried using the IC-7700 configuration, as well as several others. No luck. It is interesting that I can get MacLoggerDX to communicate (CAT control) with the IC-7610, but not WSJT-X. Most likely it is one simple thing I am overlooking. Just need to find it. This is my first icon HF radio, so I have a lot to learn. My previous experience was with the Elecraft K3. I am beginning to wish that I didn’t sell my K3 and purchase the IC-7610. In WSJT-X do you see the band dropdown with frequencies at the bottom left or are the frequencies scrambled or missing? If it’s missing it can be fixed by going to the File>Settings>Frequencies. Right click in the “Working Frequencies” area and then select “Reset”. That will restore those. I tried a few different configurations as you and no luck. I think it’ll have to wait until they add the radio to WSJT-X. One additional comment. As an experiment, I checked to see if I could separately use MacLoggerDX to interface with the IC-7610. It connected easily with no changes in the above settings, so my IC-7610 settings are at least correct for MacLoggerDX. I have been trying to get this combination of programs (WSJT-X, JT-Bridge and MacLoggerDX) to work with my IC-7610, but so far have been unable to get these to work. I am wondering if you or anyone else has been able to get these to work properly with the IC-7610. Here are my settings on my IC-7610. I wonder if there are other settings tab need to be set. I have also installed the following hamlib_settings.json file on my Mac per teh recommendation of the WSJT-X support team. Boy, I thought I replied to you and it would have been a wrong response. Sorry if I did. Anyway, as you know, at this time WSJT-X won’t work with the IC-7610 unless you go into the 7610 and change the CI-V address to a rig supported in WSJT-X (like you said), try the IC-7700. That should work, but then it’ll throw off the default CI-V address in MLDX for the 7610. However, in MLDX it’s easy to modify the CI-V address in the software. So, if you wanted to experiment with that method, it should work. I haven’t tried it yet. You would still have to disconnect the radio in MLDX and use WSJT-X for rig control. JT Bridge will log into MLDX logbook. Is that what you’re looking at? I’m just waiting until the 7610 is in WSJT-X. P.S. Your settings look like mine, but I am using 115200 for CI-V USB Baud Rate. MLDX beta 6.16 is out. It’s nice to hear from you. Thank you so much for the nice comment. You are looking for the SiLabs USB/UART driver. Download the driver and install it on you Mac. When the cable and radio are connected it will show up as “USB Audio CODEC” under the speaker icon at the top right of the screen. Just hover your mouse over the speaker icon and click on it, you’ll see “USB Audio CODEC”. In MLDX the port you’ll use will look like “SLABS_USBtoUART”. I hope this helps, let me know if there’s anything else. HNY and thank you for commenting. Is WSJT-X showing the green circle? Can you change bands with WSJT-X? Look at the WSJT-X log and see if it is correct. Yes to all of your questions. What it seems to be doing is that when it saves to the Macloggerdx log it’s not changing the frequency and band information as I change bands. It will always log the same frequency and band UNLESS I pull Macloggerdx to the front and input the correct frequency, then it will log everything to that frequency and band until I change it there again. The box that comes up and asks you if you want to log the qso has the correct info in it but when I click ok to log I will see a brief pop up window from Macloggerdx showing that’s it’s logging it but with the wrong frequency and band information. I hope this makes sense to you cause I’m pulling my hair out every time I forget to manually change the frequency and it logs the qso improperly. I see. MLDX sounds like it is overriding WSJT-X. There may be a setting in MLDX causing it. Have you been to the MLDX Yahoo group? I think I have heard this before in the past, so there must be an solution. If your internet is slow – the log command could be executing before the lookup command has completed. I’m not that familiar with JT-Bridge – but it will likely be using an AppleScript with a delay after the lookup and before the log. Just increase the delay value. Thank you for commenting and the info. Unfortunately, I am having problems with my SilLABS USB driver and cannot TX more than 3 times before it sends the TX to the speakers, so I can’t look into this yet. I seem to remember a delay setting somewhere, but I’m not sure where it was. Then again, maybe it was the Poll Interval under the Radio tab, that I’m thinking of. I hope to get mine working again soon, but I think I’ll wait until the 7610 is listed in WSJT-X. Thanks again Brian and enjoy! 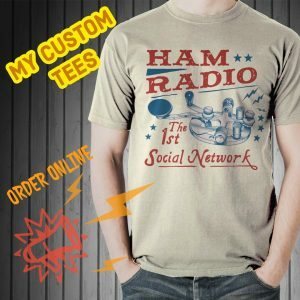 I keep getting a “Hamlib error: Communication bus error while getting current frequency” error , I’m stuck. Any words of wisdom ? It goes into some detail about that and I like using DXCommander better, once it started working hi hi. Okay? Go Here and install Hamlib. Use the Terminal App in your applications folder. Copy and paste those items a line at a time after the command prompt in Terminal. You will need to know your Mac Password. when you are typing it, it will not appear on the line. after typing it, hit enter. I found your video very helpful. However it seems that the USB input and output audio is shared with the 7300 speaker and mic. So when WSJT-X is in WSPR mode I have to turn up the rx volume on my 7300 for the signals to be decoded by WSJT. Is there are way to mute the audio on the 7300 and have it only go through the USB cable? Nice to hear from you. 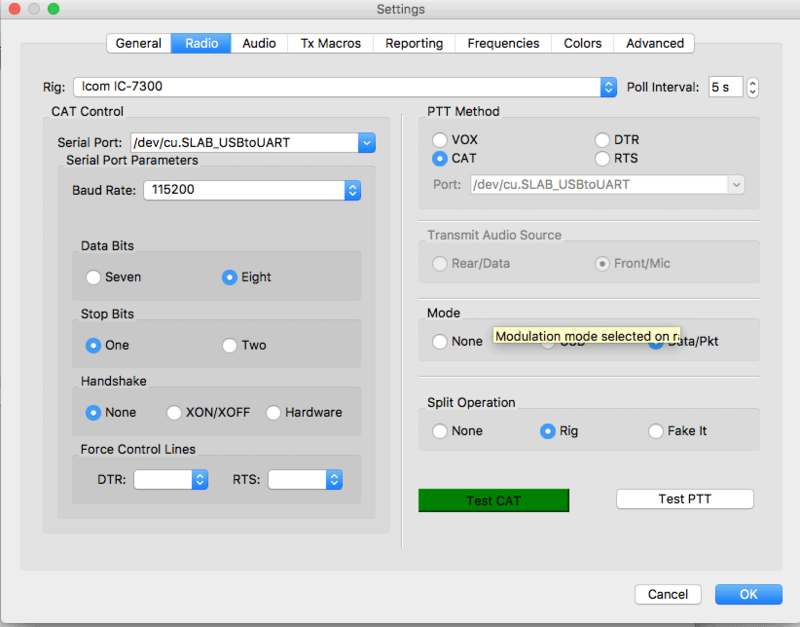 In WSJT-X I would check your Audio>Soundcard>Input device. It should be the USB Audio CODEC. It sounds like your Macs mic is picking up the sound. Sometimes it gets disabled for whatever reason. Maybe the Mac doesn’t recognize the USB cable, it gets disconnected or something changes in the system. That’s usually where I look first. Let me know. This was just what I needed! I do have one question. How do you start up these three programs? Does the order matter?